In this luxurious space you can relax on the opulent sofas and enjoy a wall of stars, made with the latest fibre-optic technology! We also welcome bookings for private parties and club events outside of our usual business hours or days. 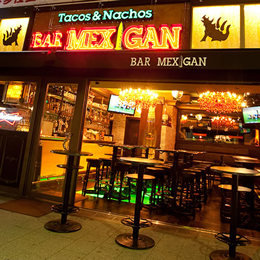 Ideally located just 300m along Nishiki Dori from Sakae Subway Station Exit 1, Mexigan is a fun place where you can try some typical Mexican treats like tacos along with Corona Beer and tequila. Let's go Latin and have a lively Mexican evening! WE LOVE CRAFTBEER! The first craft beer specialist in Nagoya ? Keg! We've collected handmade beers from microbreweries all over Japan and always have 13 varieties available on tap. With a choice selection of food to match these special Japanese regional beers, here's an ideal spot for the discerning customer! The name of this bar, Chœur, is French for “chorus”. Bar Chœur is open from 4PM every day except Tuesday. 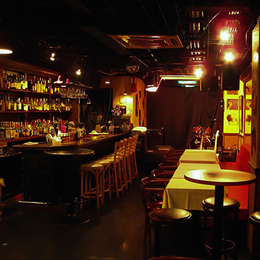 You can easily drop in for a quick drink before dinner or after shopping in Sakae, or use it as a place to meet up before going on elsewhere. However, don’t forget Chœur’s authentic bistro-style cuisine and famous Green Curry when making plans for dinner! 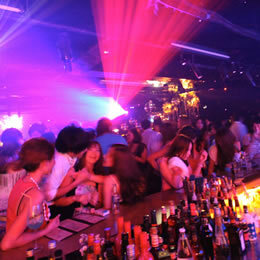 Nagoya's only club to keep the party hoppin' until 6am! Steps, Nagoya's only club to keep the party hoppin' until 6am, offers a variety of enticing entrees which include steak, pasta, mouthwatering hamburgers, as well as a lighter menu of a variety of salads to start your night off from 6pm, where you can also catch the latest sports events on any of three flat-screen high-definition TVs. In the tradition of a true Jazz bar, Memory Lane is open until the early hours of the morning on weekdays, and even later on weekends when the bar hosts live Jazz, Soul and Bossa Nova. The sound system and projector also makes this a great venue for private parties and events. The 59's - American Sports Bar and Diner, where you can enjoy the old good times of 50's & 60's. All the ingredients and materials we use, including meat, are supplied fresh, while our croutons for soup and our delicious salad dressings are always made by hand on the premises. So please come and enjoy tasty food with friendly service. Find the wine to match your mood and enjoy authentic French cuisine by candle light, while listening to relaxing music. A Spanish style bar and restaurant, Casa di Hayashi offers a relaxed atmosphere with a Latin influenced menu of authentic Spanish, Italian and Southern France cuisine. Red Rock have a killer location as well as the biggest burger in town. Home of the fun crowd. 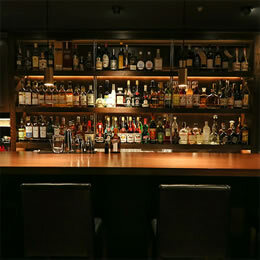 The laid back atmosphere is assisted by a serious line-up of refreshments at our stocked bar. Open 7days! Special Events Every Sunday! A lots of fun on every day! 'SORA' is a Japanese restaurant for adults, where you can forget being in a big city for a while in the busiest quarters 'KIN SAN' (Nishiki 3 Chome) in Nagoya. An energetic and long standing local night club ID-caf? 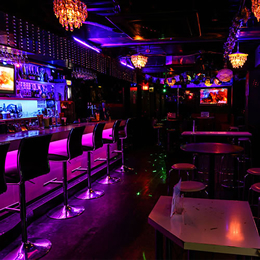 offers plenty of drinks, DJs and dancing. Dining Bar 'Tatula' harmonized classical bar, Flair show and try our wide range food menu.